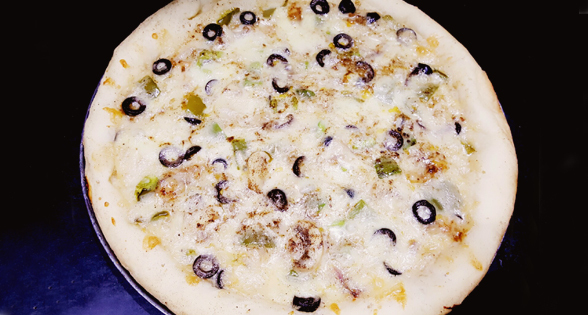 White Cheesy Creamy Pizza is a unique combination of white chicken tikka, fresh cream, cheese and white sauce. 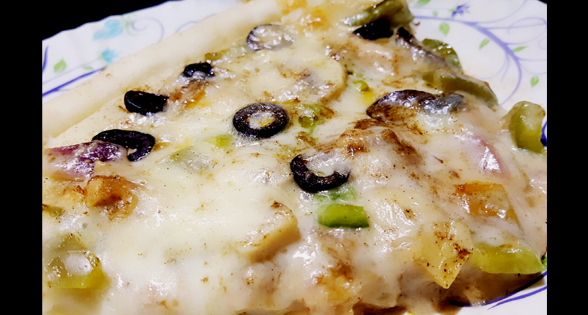 Creamy and juicy chicken enhances the flavor of this white cheesy pizza. You must try this mouth watering recipe once. Mix sugar, water and yeast in a small bowl and keep the mixture aside to bloom. Take another bowl and mix flour and salt. Now pour yeast mixture into the flour and mix well. Knead soft dough by adding warm water slowly. Place the dough in a greased and covered bowl at least for 2 hours. When dough is doubled in size, punch it down and roll out on a flat surface to make 14 – 16 inches large pizzas. Take a wok and melt butter in it on medium flame. Add the garlic and sauté about a minute. Quickly add all purpose flour while stirring. Add milk and keep stirring so that lumps cannot be formed. Also add cheddar and mozzarella cheese and mix the sauce well until it becomes thick. Add fresh cream and mix. Season with salt, black pepper, red chili flakes and oregano. Cheesy and Creamy White sauce is ready to apply on pizza. Take a wok and add some oil in it. Add ginger garlic paste and then fry Chicken for 10 mins on high flame. Add all the ingredients mentioned above except of fresh cream and mayonnaise. Cook it for 8 – 10 minutes. Turn the heat off and add ½ cup of fresh cream and Mayonnaise. Mix well. Now to Smoke the Chicken, take a Coal and burn it. Put it inside the wok, drizzle some oil on the coal and cover the lid for 3-4 minutes. Creamy White Chicken is ready for the topping. Roll the pizza dough like a chapatti. Take a pizza pan, grease it with oil, take the rolled out dough and place it on pizza pan. Now apply some white sauce on it, make a bed of chicken over the sauce. Spread all vegetable toppings one by one over the pizza. Also spread Mozzarella and Cheddar cheese. Sprinkle garlic salt, crushed red chilies and oregano on the top. Preheat the oven between 450 and 500 degrees F (250 to 260 degrees C). Now cook the pizza till 15- 20 minutes. You can also bake a pizza in a cooking pan / wok. Place an iron stand inside the wok and Pre-heat the pan. Put Pizza Pan on the iron stand and bake for 15 – 20 mins on medium flame. 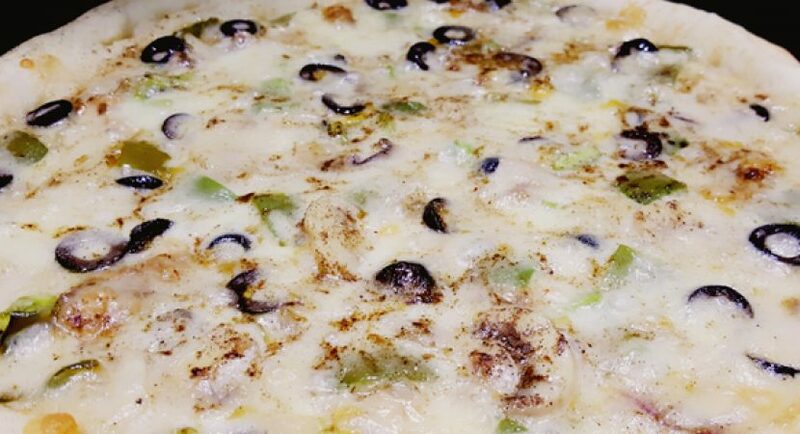 White Cheesy Creamy Pizza is ready to serve.